Check out this gently-used 2010 Honda Civic Sdn we recently got in. How to protect your purchase? CARFAX BuyBack Guarantee got you covered. Start enjoying more time in your new ride and less time at the gas station with this 2010 Honda Civic Sdn. Low, low mileage coupled with an exacting maintenance program make this vehicle a rare find. More information about the 2010 Honda Civic Sdn: With coupe and sedan body styles, available in basic, luxurious, or high-performance Si guise--plus green-focused Hybrid and natural-gas GX sedans--the Honda Civic is offered in a very wide range of models to suit the wants of small-car shoppers looking for anything from simple, cost-conscious transportation to full-featured touring. In its most basic form, the Honda Civic DX feels more sophisticated and refined than most vehicles in its price range, with perky engines, quick handling, and good ride comfort. The Civic is also one of the few small cars that offers--at the top of the range--leather upholstery and a full-featured in-dash navigation system. Finally, the Civic's longstanding reputation for resale value and reliability remain among the best among small cars. 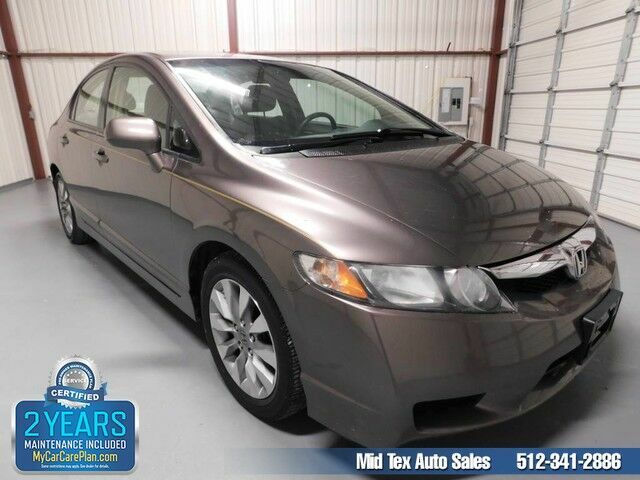 Strengths of this model include hybrid availability, reputation for reliability, Sporty driving feel, and strong resale value Visit Mid Tex Auto Sales online at www.midtexautosales.com to see more pictures of this vehicle or call us at 512-341-2886 today to schedule your test drive.